Pages tagged "Issue: Unions and Democracy"
“Imagining solutions,” the title of one of the many incredible conversations held last weekend at the annual conference of the National Alliance of Latinoamerican and Caribbean Communities (NALACC). “We chose the word ‘imagine’ deliberately,” explained Oscar Chacon, Executive Director of the Alliance. “We are often told we need to accept the world as it is.” Organizers and activists gathered from around the country, as well as from Mexico and Central America, to reflect on ten years of work together and to chart a path towards a world as we imagine it should be. United for a Fair Economy attended in support of the alliance and the incredible work being done by organizers and activists across the country. NALACC is made up of Latino immigrant-lead organizations who are engaged in an inclusive struggle for social, economic and racial justice. They are on the front lines, challenging the concentration of wealth and power. Their work is vital to forming a movement that will build a more just society, a fair economy. With the incredible challenges faced by immigrants in the U.S. and the violence and economic destitution that force many to migrate, we must hold our imaginations close. And as we imagine, we must also speak. “The words we use create our reality,” said panelist Maria Elena Letona, Executive Director of Neighbor to Neighbor, a state-based economic and social justice organization in Massachusetts. Following presentations from academics, journalists and activists, conference attendees divided into working groups to discuss what they heard and to plan. United for a Fair Economy’s education team facilitated an extended dialogue on economic inequality. This dialogue-based approach to organizing gave an opportunity to everyone attending to take ownership in the creation of a new reality. “We have to talk about power,” insisted Miguel Huezo-Mixco, who flew in from El Salvador representing the United Nations Development Program. He wasn’t only talking about the extreme concentration of wealth and power that organizations like NALACC and UFE seek to challenge, but also the power we harness to confront injustice. “How do we exercise power together?” he asked. The NALACC facilitation team documented people’s responses in order to create a plan for building power over the years to come. Organizers also offered a specific way in which power could be used to protect the human rights and dignity of immigrants across the country: “Mr. President, use the power of the pen” read a banner on the stage in front. It is the title of a campaign to put pressure on President Obama to use executive action to halt deportations. The effort reflects the incredible imagination of the strong and committed immigrant organizers. In spite of significant barriers placed by inequality, they have imagined a world in which people, immigrant and non-immigrant, are valued for their unique social, cultural and economic contributions to this country and to the world. President Obama is planning to announce an immigration enforcement overhaul that could protect as many as five million immigrants from the threat of deportation. This is thanks to an effort lead by immigrant activists and organizers across the country like those at NALACC, like the #not1more campaign, and many others waging the fight for justice. United for a Fair Economy is proud to stand by their side. For the past few weeks, the nation’s attention has focused on an unlikely epicenter of race relations, a Quik-Trip convenience store about fifteen miles north of St. Louis. It was there that 18-year-old Michael Brown, an unarmed black teenager, was gunned down by a white police officer, and it is there that a groundswell of sympathy and frustration has prompted the community, and nation, to act. The town of Ferguson was rocked by this tragic event, and has responded in an incredible way – by organizing. In addition to memorials, people are setting up voter registration tables, and this moment is on its way to becoming a movement with racial inequity at the heart of the conversation. We believe that, in the words of Frederick Douglas, “power concedes nothing without a demand.” We at United for a Fair Economy have a very simple demand: let’s build an economy that works for Ferguson, and for the south side of Chicago, and for everywhere in between. Let’s build a system that provides the same level of economic stability for communities of color as exists in middle class suburbs or affluent communities. Just as racial profiling is at the heart of this tragic event, the racial wealth divide should be a part of this conversation, and that is something that we’ve been working to bring into public consciousness for over a decade. We understand that systemic racism will always exist as long as our economy doesn’t match our ideals. That’s why we were founded twenty years ago with a simple goal: to work towards a fair economy. We live up to this ambitious mission, and our name says it all. We are united to build an economy that provides equal opportunity and equal justice for people who have been marginalized in our society based on race, gender, sexual orientation, nationality, or social class. We are united to build an economy that creates jobs with dignity, that provide living wages, and where workers have the democratic right to organize and share the wealth produced by their labor. We are united to create a robust public sector that works for the common good, funded through progressive taxes, and accountable to the people, and together, we will build this economy in a way that is sustainable and equitable for future citizens of our planet. We remain vigilant, and our hearts are with those building a movement in Ferguson, in Queens, NY, and every other community that has been rocked by violence. Our Popular Economics Education Team is once again co-hosting UFE's renowned Training of Trainers Institute in October 2014 in New Market, TN, with the Highlander Center (details below). 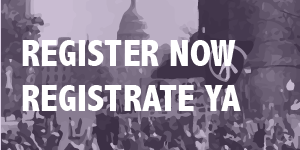 We invite organizers, activists, educators, students, and others across the U.S. who want to join and advance the movement for a just economy, to attend. Jeannette Huezo, Steve Schnapp, and Riahl O'Malley, UFE's Education Coordinators, will help you learn how to engage people in dialogue through UFE-style popular economics education workshops that demystify the economy and creatively educate, inspire, and mobilize people to take political action. The Institute ends at 1:30 p.m. on October 26. Located in the foothills of the beautiful Smoky Mountains, about an hour from the McGhee Tyson Airport near Knoxville. • If you are seeking to improve your training and facilitation skills in order to more effectively present information and engage people in dialogue about the economy. • Strategies to build a powerful social movement that will address the economic divides; and Principles and practices of popular education. • Network, build solidarity and open doors for collaboration with others working for economic justice. • Participants should arrive at Highlander on Thursday, October 23, between 3:00 and 6:00 p.m.; the program begins after dinner on Thursday and concludes after lunch on Sunday, October 26. • Sessions are conducted in the mornings, afternoons, and evenings. • Breaks are provided throughout the day to allow participants to catch their breath, reflect on and network with other participants. Registration fee is based on a sliding scale (see below) and includes the Institute fee, materials, meals, and room/board (double occupancy). Transportation is NOT included. A minimum $25 deposit is required with your application. Payment in full is due one week before the start of the Institute. We offer additional reductions to organizations sending two or more participants. Still Undecided? Watch this video from one of our previous Training of Trainers. Contact Jeannette Huezo (jhuezo@faireconomy.org, 857-277-7881) or Steve Schnapp (sschnapp@faireconomy.org, 857-277-7868) or Riahl O'Malley (romalley@faireconomy.org, 827-277-7868 x127). The bill guarantees basic protections and standards for domestic workers: 24 hours off per 7-day calendar week and 48 hours off per month; meal and rest breaks; limited vacation and sick days; parental leave; protection from discrimination, sexual harassment, illegal charges for food and lodging, and eviction without notice; notice of termination; and a means of enforcing these standards. MataHari and the rest of the MA Coalition for Domestic Workers have been working on and advocating for the bill since 2011 and were instrumental in its passage.UFE is proud to have worked with MataHari, using our signature Training of Trainers program and other workshops to provide tools and techniques to enhance their organizing and advocacy efforts. Over the last year, and funded in part by a grant from The Berger-Marks Foundation, UFE’s Jeannette Huezo led a series of interactive workshops for MataHari on organizing strategies, leadership development, contracts and negotiations, immigration policies and reforms, and the Domestic Workers’ Bill of Rights. This bill was a victory for workers’ rights and equality, and we are proud to support the cause. The signing was an exciting and proud event. It began with speeches from Lydia Edwards of the National Domestic Workers Alliance, Governor Deval Patrick, and Attorney General Martha Coakley. Then two domestic worker activists (including MataHari’s Angella Foster) shared their experiences and spoke about the importance of the bill. Next, Boston Mayor Marty Walsh and Senator Anthony W. Petruccelli (sponsor of the bill) spoke to the crowd. Finally, Governor Patrick signed the bill and the celebrations began. 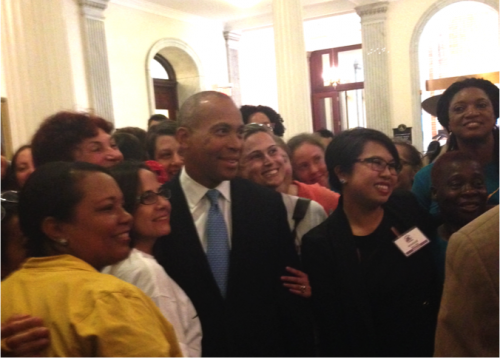 Q: What does the passage of this bill mean for domestic workers in Massachusetts? A: It means recognition and respect for the important work that domestic workers do. For so long domestic workers have been marginalized and left out of these conversations. In the 1930s and 40s when labor laws were being written in the U.S., domestic workers were left out because many were freed black slaves and they wanted to be able to continue to exploit them. That injustice still has not been completely made right to this day, so this bill is a big step. It provides a lot of rights that most workers take for granted. This is also a feminist issue, since most domestic workers are women and domestic work is a commodified version of women’s traditional role in the household. Q: How long has MataHari been working toward passage of this bill? A: The campaign has been going on for about 4 years. The legislation was introduced a year ago. Before that, MataHari did a lot of work with the MA Coalition for Domestic Workers. MataHari has historically always done work with domestic workers. At first, MataHari was working on individual cases of exploitation, but after a few years of that there was a shift to community organizing – survivors wanted to make things right and seek justice. Q: What was the greatest challenge along the way? A: Working in the coalition. Organizing is already a challenge – you have to balance making your own organization strong and powerful to get what you want while maintaining your own identity, but also being able to bend and negotiate and collaborate with other groups, legislators, etc. Q: What are the next steps for MataHari and for domestic workers’ rights nationally? A: For MataHari, the next step is implementation – passing a law is the glamorous part and many groups stop there, but we are working for social transformation. We’re working now on the “Make It Real” campaign – base building, having conversations with workers and employers, getting commitment from cities to support the bill and offer resources for implementation. After months of work from our Lynn team the city passed a resolution to support implementation of the Bill of Rights in their city. We want to expand on that and work on the local level – it’s up to each local group to decide how they will make it real. Nationally, there is a push for the federal government to do something about it. The state level work shows groundswell and our sister organizations in other states are contemplating pushing in their own states for something similar, but this should be federal work. In 2010 the International Labour Organization adopted its Convention on Domestic Workers, and 15 countries have signed on, but the U.S. has not. The U.S. should sign on to the Convention and respect the rights of women in our country. Blog post written and translated by Aliza Partlan, Development Intern. “We’re stronger if we work together.” The resolve in her voice was palpable. What began as a conversation about the hazards of over-exposure to pesticides in farmwork turned into something much more. 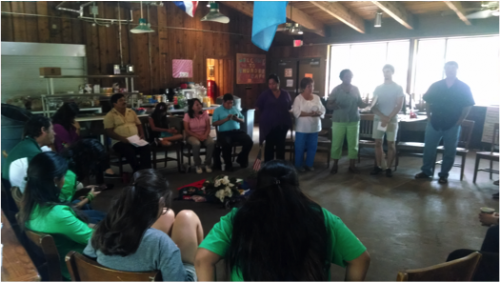 In revealing common experience among farmworkers and examining root causes of their struggles this small group began to speak about the necessity of immigrant communities working together to make real change. It became education for movement building. The mini-workshop was part of a weekend-long “Training of Trainers”, the first I attended as Education Coordinator with United for a Fair Economy. The Equal Voice for Florida’s Families Coalition invited UFE to facilitate the event. The topic: using the principles and practices of popular education in organizing for social justice. Attending were farmworkers, undocumented students, and African-American organizers working in solidarity with Latino immigrant communities. The room was filled with wisdom and experience. As part of the training fellow UFE educator Jeannette Huezo led the group in a series of exercises that demonstrated the growing economic divide in the U.S. 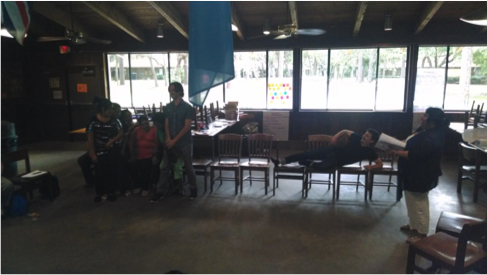 In one activity ten of us sat on ten chairs lined horizontally in front of the room. Before we knew it nine people were squished together, stuck sharing three chairs. I had seven all to myself. This, she explained, represents the reality of economic inequality in the U.S. While 70% of the population shares 10% of the wealth, the richest 10% has 90% of the wealth. “What do you see happening?” Jeannette asked those who were piled up on top of one another. “It isn’t fair!” one person shouted. “He has more than he can even use!” another person said. After a few more activities we split into small groups so that participants could have a turn developing their own workshops. This is when three organizers with the Association of Florida Farmworkers decided to rehearse their workshop on pesticide exposure. Though each organizer knew a great deal on the hazards of farm work they worked with UFE facilitators to craft a series of questions for the group so that participants could draw their own conclusions. In the course of our discussion it became clear to all of us: the risk of chemical exposure is linked to the vulnerabilities and struggles of being an immigrant in the United States. While important content was relayed the information wasn’t what gave this space meaning. These organizers could have rattled off methods of prevention, just as Jeannette could have lectured on rising inequality. But instead they drew from the experience in the room: the experience of having declining wages, no health care, no retirement, of facing the risk of being separated from one’s family because of deportation. The conversation opened a bigger question: why do the growers sit on more wealth than they can use while those who work hard and risk their health live in poverty? We all left the weekend energized for the work ahead, with the analysis and relationships necessary to forge a movement to uproot inequality. It made me proud to be a part of the team at United for a Fair Economy and proud to support and learn from activists and advocates who are leading us towards a more just future. Across the nation, workers are rallying to hoist wages for the lowest-paid jobs into the reality of today’s economy. Since 2009, the federal minimum wage has remained $7.25/hour — compensation so inadequate that it holds back hardworking adults from advancing their educations, providing for their families, and participating fully in the economic life of their communities. That’s why we together—UFE’s staff, partners, and our committed supporters like many of you reading this today—are devoting all available resources to support the work of low-wage worker organizing. In fact, it’s one of two major priorities enshrined in our new five-year strategic plan (unveiled in December). So now and into the future, UFE will be providing groups on the ground with our renowned popular education curricula, acting as an ally in state and regional struggles, keeping our supporters informed and engaged, and encouraging high-wealth allies to speak out in cross-class solidarity. This is how we will leave our mark! Why is a minimum wage increase important? It’s high time we replace the outdated image of the minimum wage worker as a teenager living at home, working for pocket money after school. The median age of fast food workers, for instance, is now 29 years old, and 68% are the primary wage-earners for their families. This is a racial and gender justice issue, too: Minimum wage workers are disproportionately people of color, and almost 66% are women. Raising the minimum wage would be good for our economy. A higher minimum wage not only increases workers’ incomes—which is sorely needed to boost demand and get the economy going—but it also reduces turnover, cuts the costs that low-road employers impose on taxpayers, and pushes businesses toward a high-road, high-human-capital model. Increasing the wealth of the super-rich doesn’t boost the economy, as they already have most of the goods they want — whereas when low-income people have more money in their pockets, they spend it. So what’s happening, and how is UFE involved? United for a Fair Economy is proud to do our part! UFE is working with SEIU to develop educational curricula for the "Fight for 15" campaigns, just as we did with the group’s earlier "Fight for a Fair Economy" campaign to organize fast food workers. It was the recent series of strikes by fast food workers that brought this issue fully into the public’s view and ignited the current wave of minimum wage organizing. United for a Fair Economy is working with Interfaith Worker Justice to organize a faith-based workshop on inequality at their national conference in Chicago this June, a gathering of faith leaders, organizers, and leaders from worker centers around the nation. 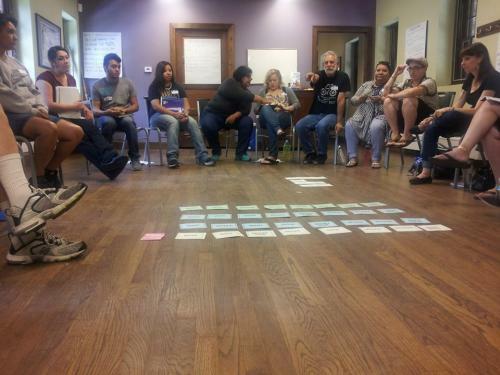 Looking to widen our involvement further, we have begun dialogues with other grassroots labor organizing groups about ways to work in partnership and strengthen the broader movement for wage justice. 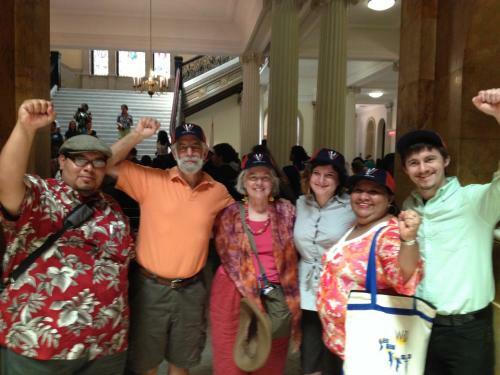 Here at home, UFE is a member of RaiseUp Massachusetts, a coalition to raise the state minimum wage to $10.50 by 2016, and more importantly to tie it to inflation for the future. We’ve sent alerts to our supporters and spoke at a recent lobby day (where there was also a screening of Reich's Inequality for All). The wage hike has been passed by the MA House of Representatives, and the push is on to make sure the full package of changes is enacted this year. There are minimum wage initiatives on the ballot or advancing in state houses in dozens of states this year. If you are organizing for low-wage worker justice in your community, let us know! We want to help. According to the Center for Labor Research and Education, the families of more than half of fast food workers are enrolled in public assistance programs. Tax Day 2013 is here! Looking ahead, the House of Representatives, Senate and President have all put forward budgets for 2014 that represent three differing visions of how the federal government should raise revenue in the years ahead. All sides are doing their best to appear willing to compromise, but before a unified budget is passed, House Republicans, Senate Democrats and the Administration will all have to agree on the specifics. In other words, it’s unlikely that anything will happen soon. Meanwhile, Senator Max Baucus (D, Montana) and Representative Dave Camp (R, Michigan) - the two top tax policy legislators in the Senate and House respectively - have also announced their earnest intention to address major tax reform. If they are successful, it will be the first comprehensive overhaul of the tax code since Ronald Reagan's effort with congressional Democrats in 1986. The tax reform effort from Baucus and Camp (along with members of their committees - Senator Orin Hatch (R, Utah) in particular) is scheduled to be drafted over the next several months, before being released in August, just before Congress returns from its summer recess. Their tax overhaul is likely to come before the full Congress in September, just when budget negotiations might be truly heating up (fiscal year 2014 starts on October 1, so a budget or continuing resolution must be passed by the end of September to avoid a government shutdown). We're keeping our focus on the upcoming battle over tax reform, and on the estate tax. Return Estate Tax to 2009 Parameters and Close Estate Tax Loopholes. The Budget returns the estate tax exemption and rates to 2009 levels beginning in 2018. Under 2009 law, only the wealthiest 3 in 1,000 people who die would owe any estate tax. As part of the end-of-year “fiscal cliff” agreement, congressional Republicans insisted on permanently cutting the estate tax below those levels, providing tax cuts averaging $1 million per estate to the very wealthiest Americans. [The Budget] would also eliminate a number of loopholes that currently allow wealthy individuals to use sophisticated tax planning to reduce their estate tax liability. These proposals would raise $79 billion over 10 years. All other questions about the budget aside, it's good news that the President is proposing positive changes to the estate tax. There is more revenue to be had with a stronger proposal, and we'll be working with our partners and allies to get the strongest possible estate tax included in any federal budget or comprehensive tax reform package. Our Popular Economics Education Team is hosting UFE's renowned Training of Trainers Institute in June 2013 in Boston, MA (details below). We invite organizers, activists, educators, students, and others across the U.S. who want to join and advance the movement for a just economy. Transformative education—which includes reflection, thoughtful analysis, and learning from each other—is vital to the success of any movement for social and economic justice. In order to challenge the status quo, we first need to make sense of the roots of the Great Recession and, more broadly, the ways in which our economic system creates and perpetuates class, race, and gender inequality. Working toward a shared understanding of how we got here and a shared vision for the future will help us to build a cross-race, cross-class movement for an equitable, democratic, and sustainable economy. 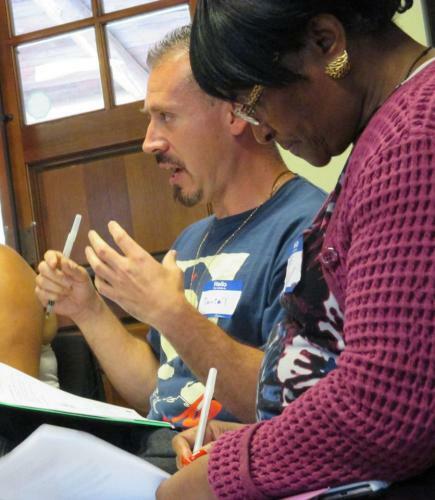 UFE's Training of Trainers Institute explores the causes and consequences of inequality and provides participants with tools to inform their communities and inspire political action. On-site check-in from 3:00–6:00 p.m. on June 6, 2013; The Institute ends at 1:30 p.m. after lunch on June 9. Conveniently located in Boston's South End neighborhood, minutes from Back Bay, Copley Square, the Boston Common, Public Garden, and more. Jeannette Huezo and Steve Schnapp, UFE's Senior Education Coordinators, will train you in how to lead UFE-style popular economics education workshops that demystify the economy and creatively educate, inspire, and mobilize people to take political action. Principles and practices of popular education. Participants should arrive at the Conference Center on Thursday, March 14, between 3:00 and 6:00 p.m.; program begins after dinner on Thursday and concludes after lunch on Sunday. Sessions will be conducted in the mornings, afternoons, and evenings. Breaks will be provided throughout the day to allow participants to reflect and network with other participants. Registration fee is $500, which includes the Institute fee, materials, meals, and room/board (double occupancy). Transportation is NOT included. Public transit (MBTA) makes for simple and affordable travel from Boston Logan Airport to the training site and back. We offer a reduced fee to organizations sending two or more participants. Partial scholarship is available to participants from low-income communities and/or resource-limited organizations. If you require financial assistance to attend the Institute, you need to complete a scholarship request form after submitting this application and paying your deposit. A minimum $25 deposit is required with your application. Payment in full is due one week before the start of the Institute. Contact Jeannette Huezo (jhuezo@faireconomy.org, 857-277-7881) or Steve Schnapp (sschnapp@faireconomy.org, 857-277-7868). Stay tuned for application details.